(Nanowerk News) To the naked eye there is nothing to see, and yet the small transparent container holds something never observed before. For the first time, scientists are studying asteroid dust collected by a spacecraft and returned to Earth. Ute Böttger, from the Institute of Planetary Research at the German Aerospace Center (Deutsches Zentrum für Luft- und Raumfahrt; DLR), belongs to one of 11 teams across the world that are carrying out scientific work on the asteroid particles from the Japanese Hayabusa mission. 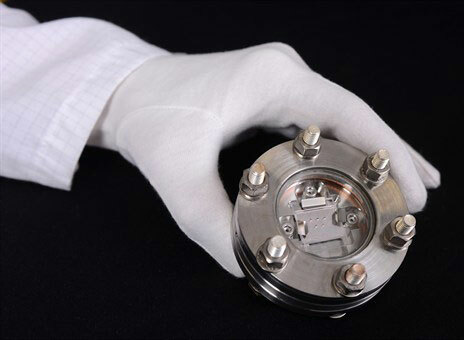 The tiny particles from asteroid Itokawa, which Ute Böttger and Sergey Pavlov are studying with a Raman microscope, measure less than a tenth of a millimetre in diameter and are contained in a nitrogen atmosphere to prevent contamination from terrestrial influences. “These really are extraterrestrial,” says physicist Böttger. Along with Iris Weber from the University of Münster, they are analysing the mineralogical composition of the particles. “Besides Moon rock from the Apollo and Luna missions, these samples are the only material ever collected directly from a body in the Solar System and returned to Earth,” explains Böttger. “And for the first time, we have asteroid material of which we know the exact origin and that was not altered upon atmospheric re-entry.” Although nobody can say for sure which celestial body meteorites discovered on Earth have come from, the origin of the minute particles from the Hayabusa mission is certain; they come from asteroid Itokawa, where the Japanese spacecraft collected surface samples in 2005. It is a major accomplishment that the unique asteroid material made it to the DLR laboratory in Berlin at all. The Hayabusa mission actually started off inauspiciously. The spacecraft reached the elongated, slightly banana-shaped asteroid, which measures just 500 metres long, somewhat later than planned. The probe was intended to use a funnel to collect surface samples that had been kicked up by firing a small projectile onto the surface of the asteroid. During the first attempt to collect a sample, the spacecraft did not respond as intended; however, the second approach to Itokawa was successful. After a three-year delay, caused by reaction wheel failures and only a few of the batteries on board remaining functional, Hayabusa (Japanese for ‘Peregrine Falcon’) finally made it back to Earth. On 13 June 2010, the return capsule landed by parachute as planned, close to the Australian desert town of Woomera, from where it was recovered. The scientists only found out whether or not samples had in fact had been returned from an asteroid for the first time after opening the sealed sample container. Initial studies of the minute particles then indicated that the Hayabusa spacecraft had indeed brought back material from its visit to Itokawa. The asteroid particles that have been studied at DLR are now on their way to team partners at Lund University and the University of Manchester for further analysis. 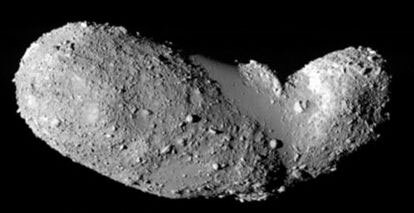 Itokawa is a primordial asteroid up to 4.5 billion years old, so the results could provide scientists with information on the origin of the Solar System. “All our theories have previously been derived from meteorites, but now we are working with original material – so perhaps we will get an insight into the big picture,” says Weber. The next Hayabusa mission is due to launch in 2014. Its target is asteroid, 1999 JU 3 – “an asteroid whose rock might have come into contact with water,” according to DLR planetary researcher Ralf Jaumann. The DLR Institute of Space Systems in Bremen is contributing the Mobile Asteroid Surface Scout (MASCOT) asteroid lander to the Japan Aerospace Exploration Agency (JAXA) mission. MASCOT is a ‘hopping’ lander that will, for the first time, move across the surface of an asteroid, which will enable it to take measurements at different sites. As it does so, a DLR radiometer will measure the temperature of the asteroid and a DLR camera will image the fine structure of the surface of 1999 JU 3. The lander will be controlled from the DLR Microgravity User Support Center (MUSC) in Cologne. In the meantime, a suction tube will be collecting material in a sample container on this mission too, and will once again return it to Earth for laboratory analysis.